Get objective, honest opinions from other parents about their experiences with NoTube. We know that finding the best solution for teaching your child to eat without a feeding tube can be intimidating. You’d like to talk with other parents who have gone through the process already and get their perspective. Fortunately, there are many options for you to contact families that have participated in the past and they’ll discuss with you openly about what they experienced. Click on the button below and join our Facebook groups. We have created special Facebook groups for parents who have gone through one of our programs. The members cheer each other on, and are always there to tell their stories. It’s a great place to hear about the parent’s experience in our programs. If you’d like to join our groups just click on this button and we’ll add you quickly. We’ve been fortunate enough to have worked with parents that have liked working with us so much that they have wanted to become an integral part of our NoTube family. These parents have agreed to meet with whomever is interested in one of our programs, of course at no cost to you. You can just contact them directly below. Would you like to meet someone who has a child in a similar situation to yours? 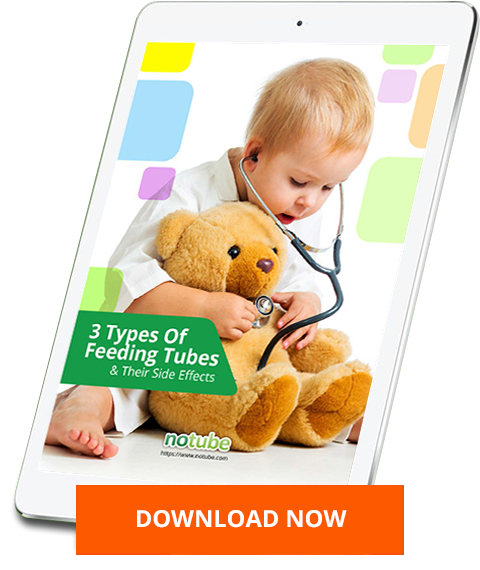 If you don’t know which type of feeding tube is the right choice for your child this free guide will introduce you the 3 types of feeding tubes, reveal how they work and which side effects they may cause. The potential side effects they are known to cause.